SPRING is finally here and, naturally, it puts one to thinking about sunshine and flowers! The Country Floral Dynamic Textured Impressions Embossing Folder is the perfect touch for spring projects and it’s a FREE Sale-A-Bration Item with any $50 Product Order. That’s right. It’s FREE with any $50 Product Order! This can help you make such beautiful projects, and it’s so versatile! For this card, I used Powder Pink Stampin’ Ink and Cardstock. I inked the Country Floral Embossing Folder with Powder Pink Stampin’ Ink, then placed a piece Whisper White Cardstock in the Folder and ran it through the Big Shot. I loved the subtle elegance! I ran a piece of the Powder Pink Cardstock through the Subtle Dynamic Textured Impressions Embossing Folder for the base, then punched out a piece of it from the center using the Story Label Punch, a Sale-A-Bration Coordination Item available for purchase. The sentiment is from the Part of My Story Cling Stamp Set and is also a Sale-A-Bration Item FREE with any $50 Product Order. 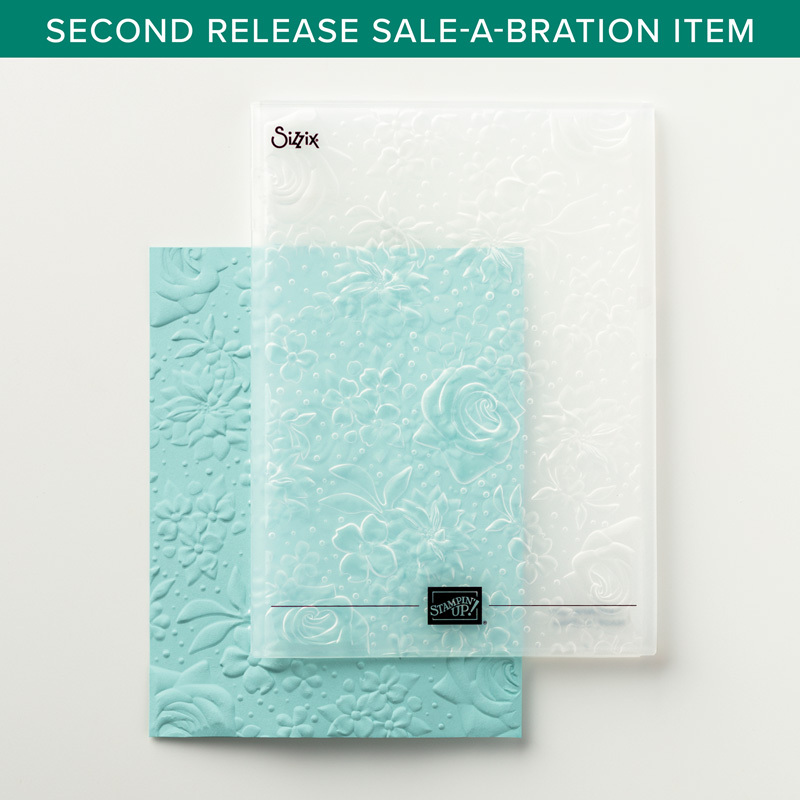 I just couldn’t resist pairing this folder with a piece of the Painted Seasons Designer Series Paper Sale-A-Bration Item. I used a piece of Lemon Lime Twist (retiring soon!) Cardstock and the Tea Room Ribbon Combo Pack for the ribbon. An elegant touch! I love working with Stampin’ Up’s Vellum Cardstock, so I ran it through the Country Floral Embossing Folder, then used Stampin’ Blends to add touches of color to accent some of the elements. The sentiment is from the Butterfly Gala Photopolymer Stamp Set found in the Occasions Catalog. The Calypso Coral Twine is from a past Paper Pumpkin Kit. JUST TEN DAYS LEFT FOR SALE-A-BRATION!!! That’s right–JUST 10 DAYS!!!!!!!! Supplies are available while supplies last, so go ahead and make your shopping list and place your order today for FREE Sale-A-Bration Items. But that’s just ONE way to Sale-A-Brate!! 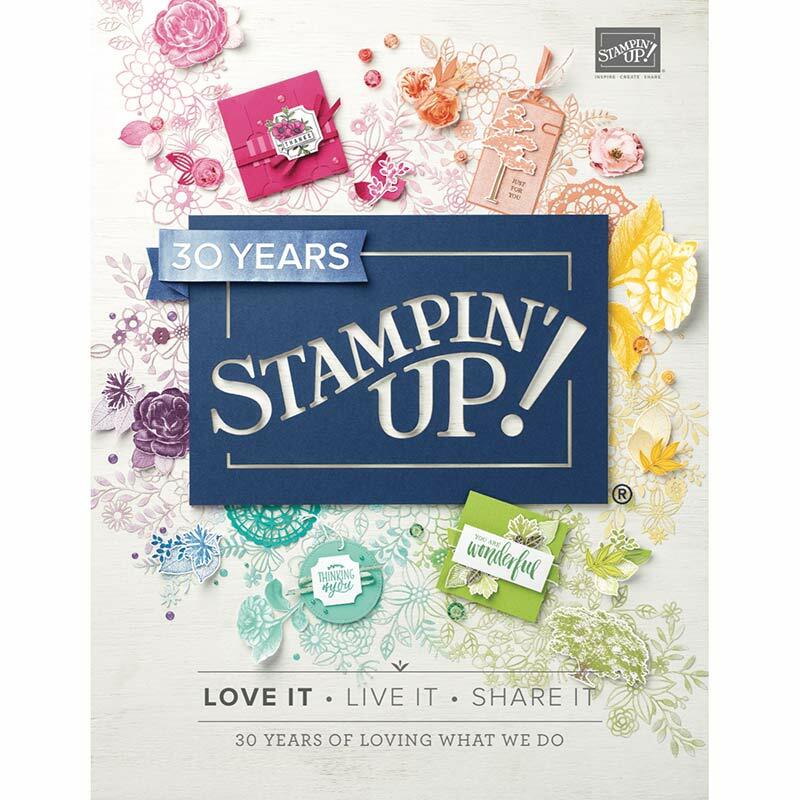 The VERY BEST DEAL is to join Stampin’ Up! and the Crafting on the Hill Team for just $99, shipping included, and get $175 of Stampin’ Up! Product of your choice!! OR for $129, shipping included, get $175 of Stampin’ Up! Product of your choice PLUS the beautiful, spacious Craft & Carry Tote. An incredible deal!!! Then for at least 6 months, you will get a 20% Discount on all your Stampin’ Up! purchases. Go to http://www.craftingonthehill.stampinup.net and click on the Join the Fun tab, or just contact me and let’s get together to get you signed up BEFORE Sale-A-Bration ends on March 31st! You can also Host a Party and earn EXTRA Stampin’ Rewards during Sale-A-Bration! IN THE APRIL PAPER PUMPKIN KIT!! Distinktive Stamps in the April Paper Pumpkin Kit. Definitely “ooohh” and “aaahhhh” worthy! 1. Distinktive stamps give you photo-realistic images with just one stamp. They have a special texture that gives added depth and dimension in a single step. 2. These stamps are available only from Stampin’ Up! and are made using a patent-pending process. 3. Distinktive stamps are available in red rubber and photopolymer; Paper Pumpkin’s April kit includes photopolymer stamps. 4. Shop Distinktive stamps at http://www.craftingonthehill.stampinup.net by searching “Distinktive,” or look for the Distinktive icon in Stampin’ Up! catalogs. Subscribe by April 10th to make sure you get the April Paper Pumpkin Kit by shopping at https://www.paperpumpkin.com/en-us/sign-up/?demoid=2166089.